New Caledonia, a French archipelago in the South Pacific, is preparing for an independence referendum - the last step in a three-decades-long decolonization effort. Sunday's vote is key to settling tensions between the native Kanaks, who once suffered from strict segregation policies, and descendants of European colonizers. It is also a test of the depth of the links between France and the territory, which lies east of Australia and has about 270,000 inhabitants. Voters have to answer the question "Do you want New Caledonia to gain full sovereignty and become independent?" Observers say that, based on past electoral results and polls, voters are likely to back remaining in France. The territory enjoys a large degree of autonomy, but relies on the French state for its defense, police, foreign affairs, justice and education. The referendum is the result of a process that started 30 years ago after years of violence that pitched pro-independence Kanak activists against those willing to remain in France. In 1988, 19 Kanak tribesmen died after they took French police hostage in a cave on the New Caledonian island of Ouvea. Four soldiers were also killed. The violence represented a "tremendous shock" and a "key moment" for France, French historian Isabelle Merle said. "This is the first time a carefully thought-through peaceful decolonization process has been considered," she said. The Ouvea events prompted a peace deal that year between rival loyalist and pro-independence factions that laid the ground for the referendum. Visiting the territory in May, French President Emmanuel Macron acknowledged the "pain of colonization" and paid tribute to the courage of those involved in the peace process. He also handed the Caledonian government a document that stated the archipelago became a French possession in 1853 - a gesture intended to symbolize the final chapter in the period of colonization. "We are no longer in a time of possession, but a time of choice", he said. Under French colonial rule, the Kanaks were forced to live on reserves in remote areas, pay specific taxes and do mandatory work for very low wages. They had to respect curfews and were not allowed into some places reserved for European settlers. Merle, whose researches focus on France's decolonization process, said this led to "a big gap between the local communities." "In the whole French colonial emprise, the Kanaks have probably been those who have been despised the most, in the sense that they were seen as savages," she said. Today the Kanaks represent about 40 percent of New Caledonia's population, while people of European descent make up about 27 percent. Others include those who emigrated from Asia and other Pacific islands. 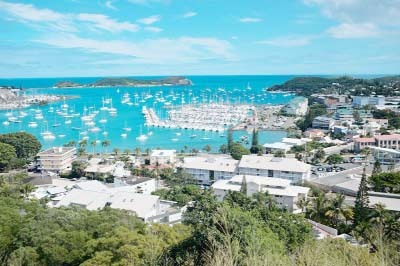 Long used as a prison colony, New Caledonia remains an important part of France's overseas holdings that stretch from the Caribbean to the Indian Ocean and the northeast coast of Canada. Together, they enable France to lay claim to the world's second largest maritime domain - the area within 200 nautical miles from the coast in which each country is sovereign and can exploit natural resources - almost equivalent to that of the United States. New Caledonia's turquoise lagoons are a tourism magnet, and its mines contain a quarter of the world's known nickel supplies, a metal used in electronics manufacturing and many other industries. But like other French overseas territories, the territory suffers from much higher unemployment and poverty than in the mainland, and many residents share a feeling of being neglected by Paris.